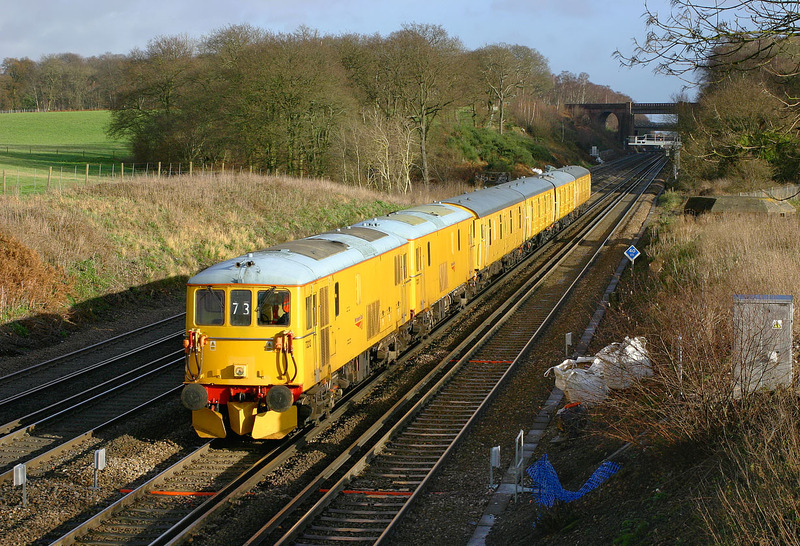 Network Rail's 73212 & 73213 make a spectacular sight as they pass Potbridge (between Woking and Basingstoke) on 5 December 2007 with the 5Z73 10:20 Tonbridge to Eastleigh stock move, conveying four GLV vehicles. This would appear to represent all the remaining non-preserved Class 489 former Gatwick Express driving trailers. Note the new relay box and associated materials by the trackside at this location. There are a couple of ominous looking holes in the bank - surely not another new signal gantry like the one in the background!